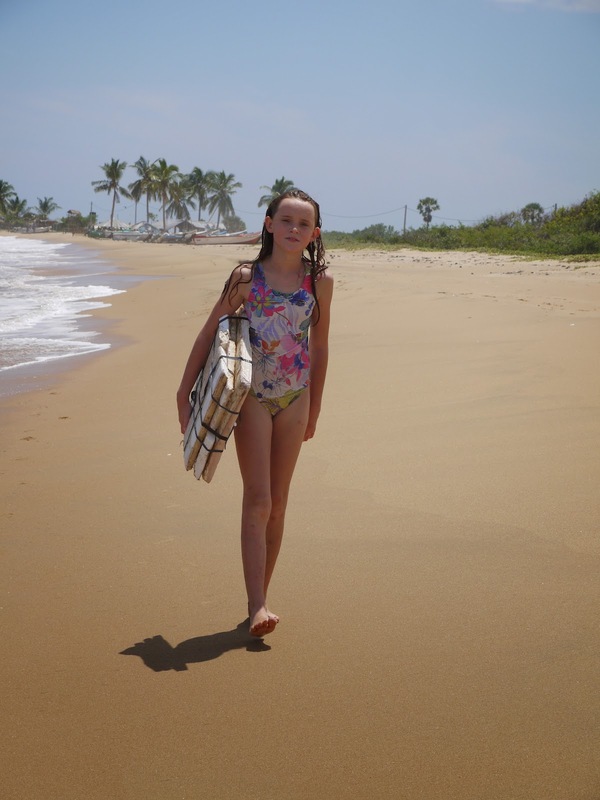 Tess Read: Sri Lanka - elephants, wild peacocks, baby monkeys at play, incredible food, even more incredible beaches, and a ghetto surfboard! Sri Lanka - elephants, wild peacocks, baby monkeys at play, incredible food, even more incredible beaches, and a ghetto surfboard! 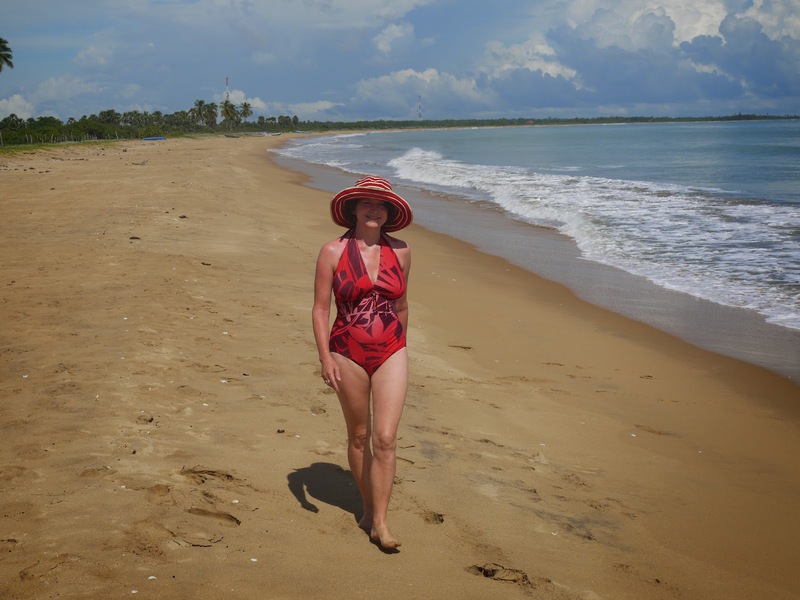 We only had 8 days in Sri Lanka but it seemed so much longer, in a good way! 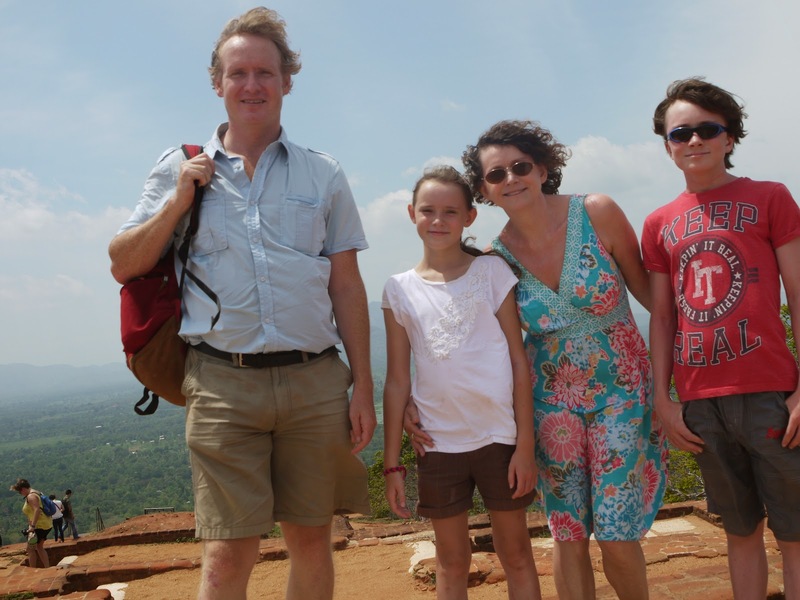 We stayed in Sigiriya in the centre of the island for 4 nights. This was the only element of the trip which I had planned in advance. 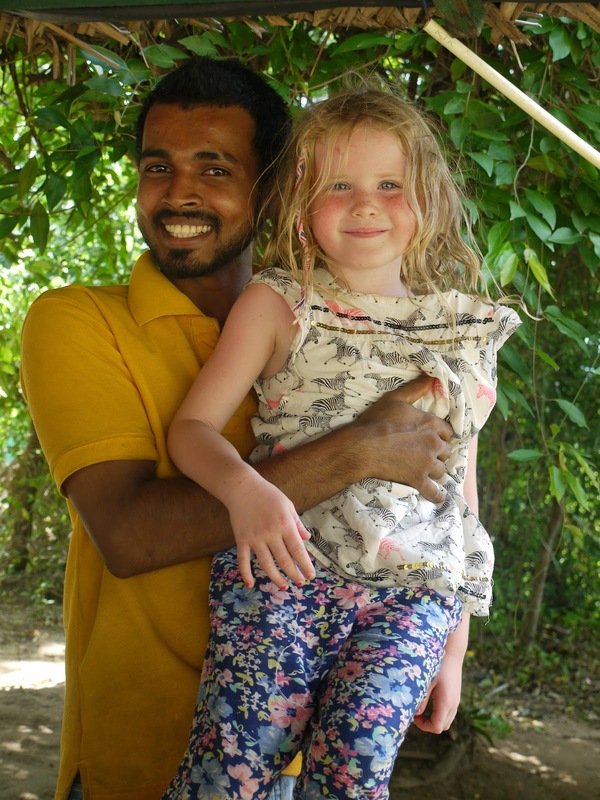 It was a homestay I found on airbnb - Lal's homestay - and I had arranged with Lal by email that his brother would meet us at the airport so that our arrival would be simple. Everything worked like clockwork (which was good as the journey there was exhausting, with a 5am departure from Jordan, 2 flights, and a three hour drive at the end arriving at 1am). The homestay turned out to be just what we were after - simple clean rooms with a friendly family with the added bonus of delicious home-cooked food every day - the only problem was our inability to eat all that they provided us with. 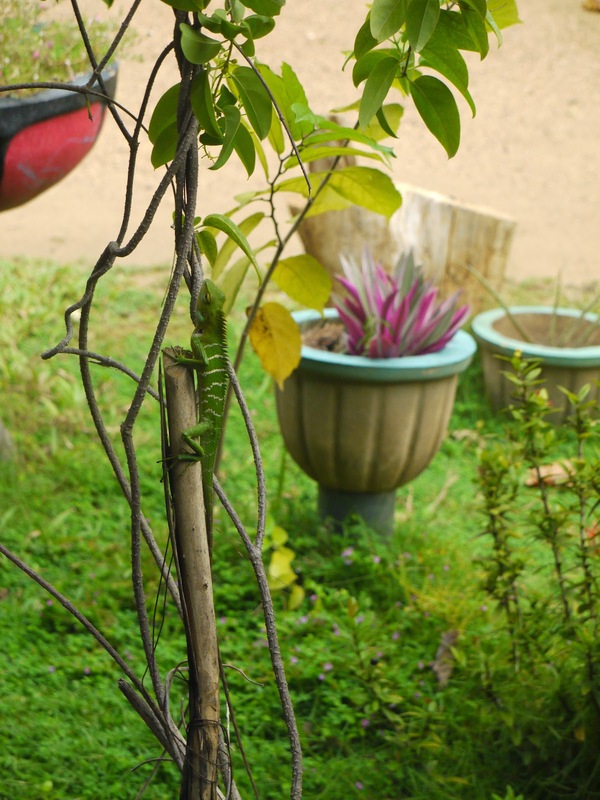 As well as this Lal's garden was a treasure trove of delights - from a chameleon we spotted one day, to the many monkeys who came to play several times a day. 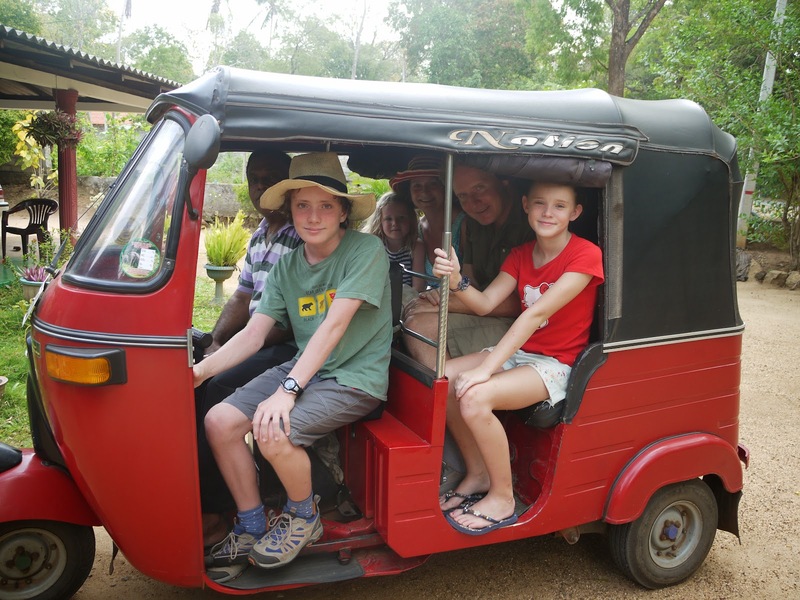 Sigiriya itself was a tiny town with few shops to distract us but plenty of cafes with free wifi for doing beach school in with the kids each day. 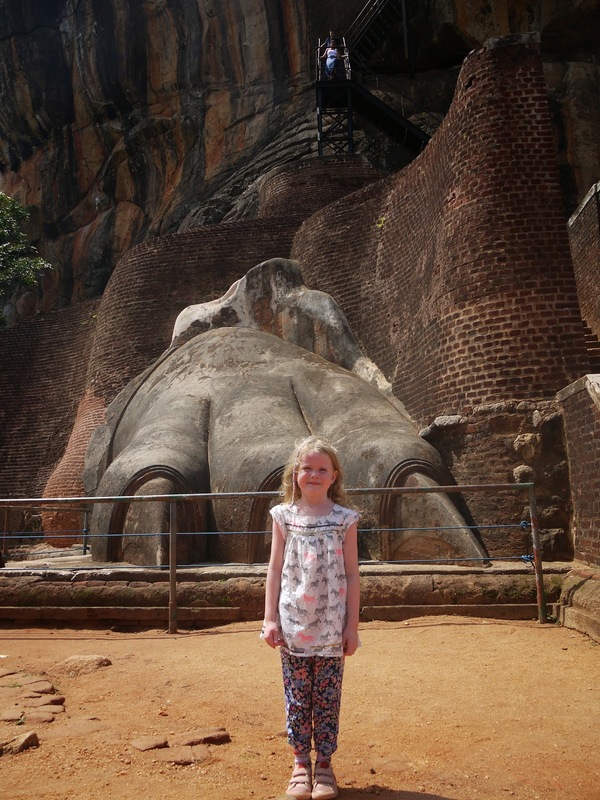 And there there is the thing that Sigiriya is famous for - The Sigiriya Rock, which was cool ! But crazy, and with a crazy history. Its history is that a mad king a whole bunch of years ago (about 700) fell out with his father - now, we've all done that... but this dude took the thing to extremes. The father began it all by bestowing the crown on the elder brother, Moggallana, so the Ed Miliband of this family, Kassapa, went to his father and demanded redress. Specifically he said to him "I'll kill you if you don't tell me where your treasure is so that I can at least have that." OK, I think it's fair to say the Miliband clan comparison has broken down now, I'm pleased to say. The father responded to this by saying, "Let me gaze one last time upon my famous irrigation system and I will tell you." (Already makes no sense, btw, if he were to tell him it wouldn't have to be the last time, would it?) So Kassapa agreed, and they went to the waterworks whereupon said father gathered the water in his hands and let the droplets fall through and said "This is my treasure. There is no other." So Kassapa was understandably pissed off at being led up the garden path by this load of baloney, but, as I mentioned earlier, kind of overreacted. The guidebooks say he walled his father up in a room and left him to die. But I bet he didn't actually wall him up himself, I bet he got someone else to do it for him. Having done this he then tried to kill his brother (the David Miliband of the family, OK I'll stop this analogy now, I promise) who upon escaping the assassination attempt (you see, he didn't even try to kill his brother himself, he got someone else to do it for him) fled to India. 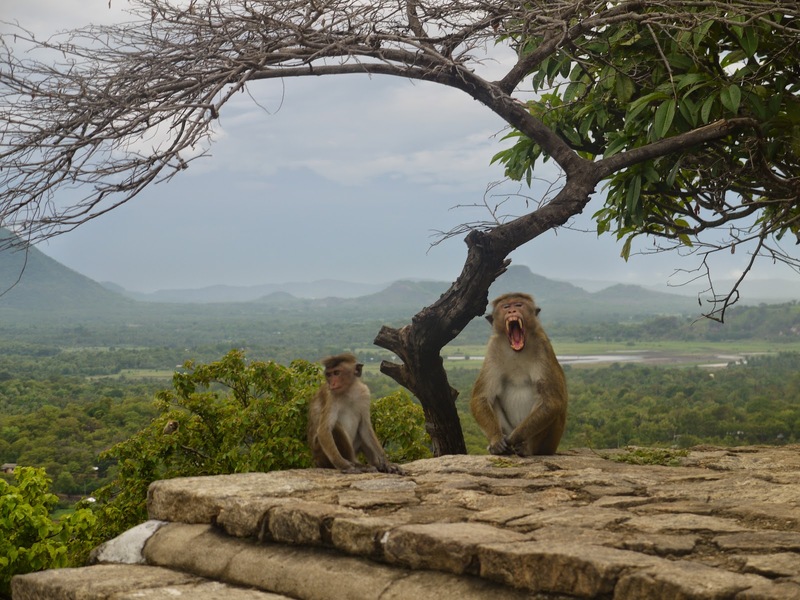 Meanwhile, Kassapa, concluded that hanging round his old dad's palace trying to get things done was looking at bit dicey what with having created so many enemies, and so high-tailed it off to the very middle of Sri Lanka, and found a great big rock to climb up in a place called Sigiriya. And then he built a palace on top of this rock - it is an astonishing achievement, and an astonishing sight to see, even though the remains of the palace are only ruins. The rock stands almost alone in the flat landscape and it is in fact a bunch of massive boulders shoved together by geological events in the distant past, and it is a long very breezy exposed climb, even with stairs built upon it. It is impossibly situated, atop 600 foot high boulders which would be hard enough to scale without ropes and pietons, let alone to climb with a bunch of bricks on your back and build a palace on top. As you climb you can see the original footsteps cut into the rock by the climbers of so many hundreds of years ago who must have carried vast quantities of bricks up to the top to build the palace. 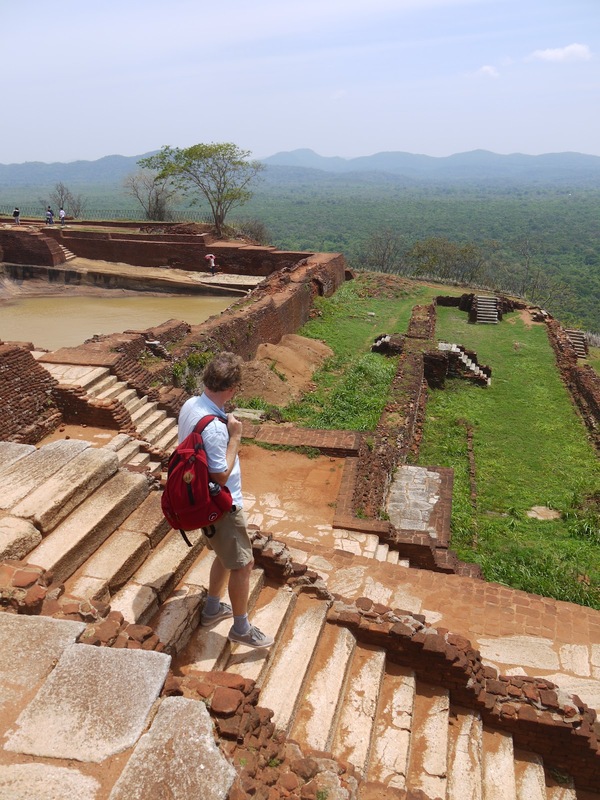 So, as the guidebooks say, Kassapa built his palace on top of the wildly inaccessible Sigiriya rock - but I bet he didn't built it himself.. So the story of how the palace was built is pretty insane, and the story of how this King then lost his power and his life, is also pretty mental. The older brother, Moggellan, ie David Miliband (sorry, I promised to stop doing that), spent the 7 years that Kassapa had spent getting people to build him a palace on top of a rock, in India gathering an army of mercenaries to come and wage war with this nutter of a brother and reclaim his title. Word reached Kassapa that Moggellana was on his way determined to defeat him and so Kassapa gathered his troops together to set about defending his palace, which was by now handily placed on top of a high rock. Should be easy, huh? Well, here's a great way to lose an unassailable position - come down from it even before the enemy makes you. Yup, Kassapa decided that the thing that would most put the fear of God into his brother would be the sight of him riding out to wage battle with him on top of an elephant. Because this was exactly analagous to the time of Hannibal and his brother would never have seen anyone riding an elephant before, what with being from Sri Lanka and everything.. Apparently, Kassapa's aides tried to remonstrate with him with arguments such as "But, almighty and crazed one, wouldn't it be better if we defended the rock from, er, the top of the rock?" and "If you ride out on the elephant and the elephant runs away in fear at the sight of the army then what's going to happen to me and the rest of us? Death or slavery, that's what." But Kassapa wouldn't listen, and instead rode boldly out on his elephant, who instantly took fright at the sight of Moggellana's army and ran the other way. Kassappa was captured and killed himself, and the aides did about as well as you, and they, might expect. Mogellana decided he didn't fancy spending his days on top of his brother's bonkers rock and the palace was abandoned. Not before time, it seems to me. 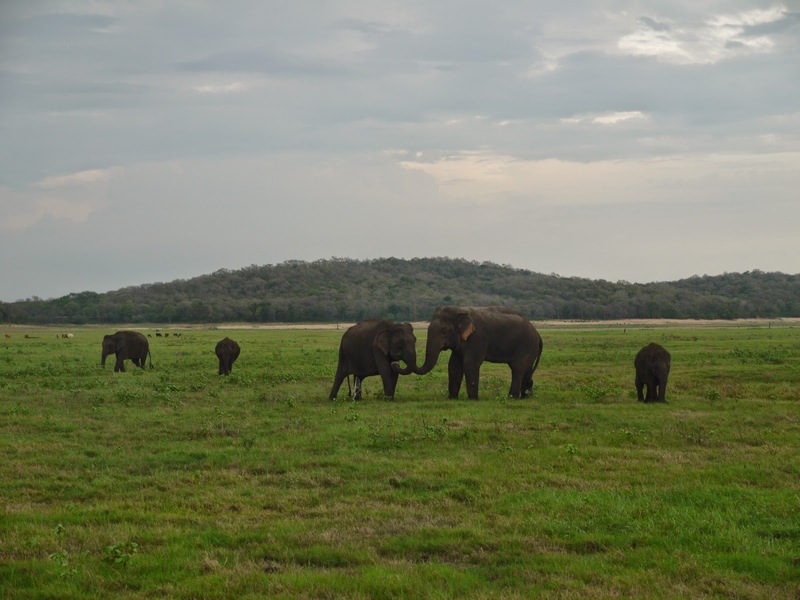 Talking of elephants, in Sigiriya we went on safari one day - I had been warned of this by a friend who had said that the only disappointment for her in a visit to Sri Lanka many years ago was the safari which was so bad it became a running joke. The only elephant they saw was one visibly chained to a tree, to which their guide pointed and said "wild elephant". They replied, "No, it's not, it's chained to that tree - and there are leaves over the chain to try to hide it." 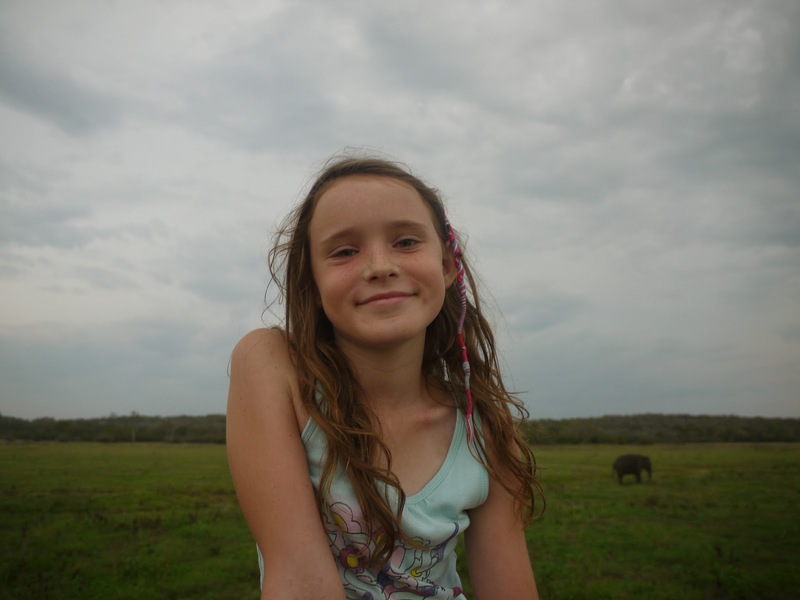 "Wild elephant" came back the indefatigable stern reply. But it seems that times have changed. 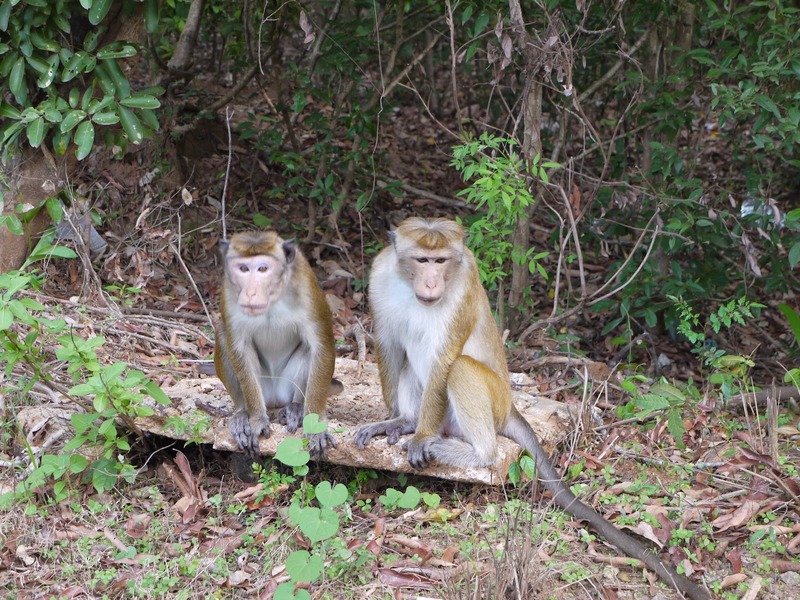 Sri Lanka now makes a big deal of its wildlife parks and they are very well run and regulated. We saw lots of lovely ellies roaming around in herds with two or three tiny little ellies who our guide thought were only a month or so old. There were a lot of us tourists watching them, some international, some local, but why wouldn't there be; they were a beautiful sight. We also saw several wild peacocks, and an amazing water monitor about 3 feet long. 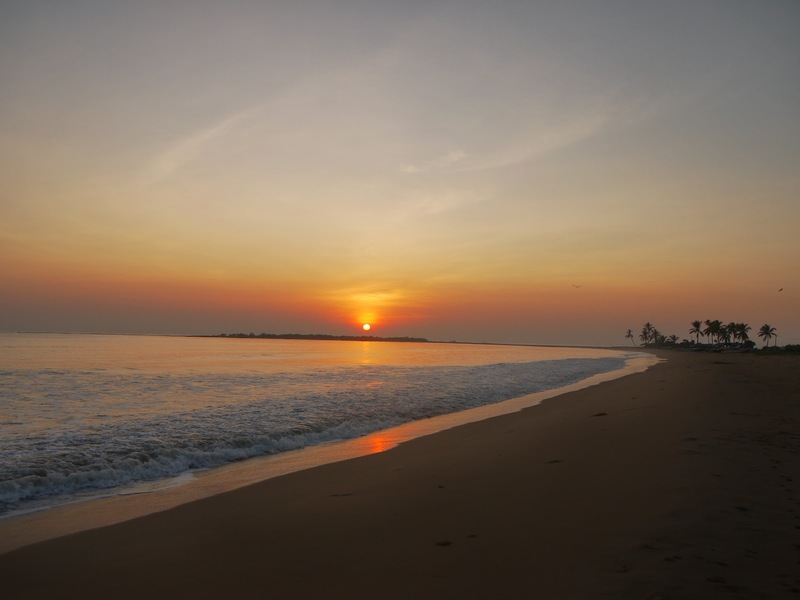 I have heard that Sri Lanka is the jewel of the Indian Ocean, and having been there I can see it is well-named - it is so fertile, green and lush. 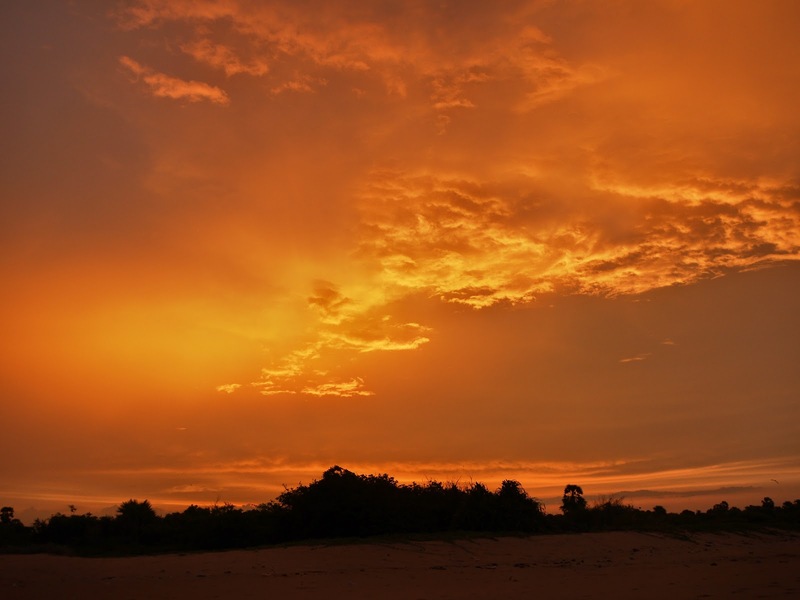 It made the most striking change from the desert, and the hot sticky heat was a welcome alternative to the bone dry life-sapping heat of the Middle East. And the wildlife is everywhere - just everywhere! In the Middle East you feel that everything that lives is just about clinging to some kind of almost impossible life, whereas here there is sun, there is rain, there is such lush life, and it is good. From Sigiriya we hadn't planned where we would go next, although I had been thinking of perhaps Kandy, another cultural centre, for a few nights, but I made the mistake of mentioning to Danny that another friend had recommended various places in Sri Lanka to me including Tranquility Coral Cottages at Vakairi and so Danny of course went all weak at the knees at the prospect of the sea! So I phoned them with our local SIM card (such a good, and cheap, investment) and they had availability - 2 bungalows for us and the kids, and I booked for 2 nights. 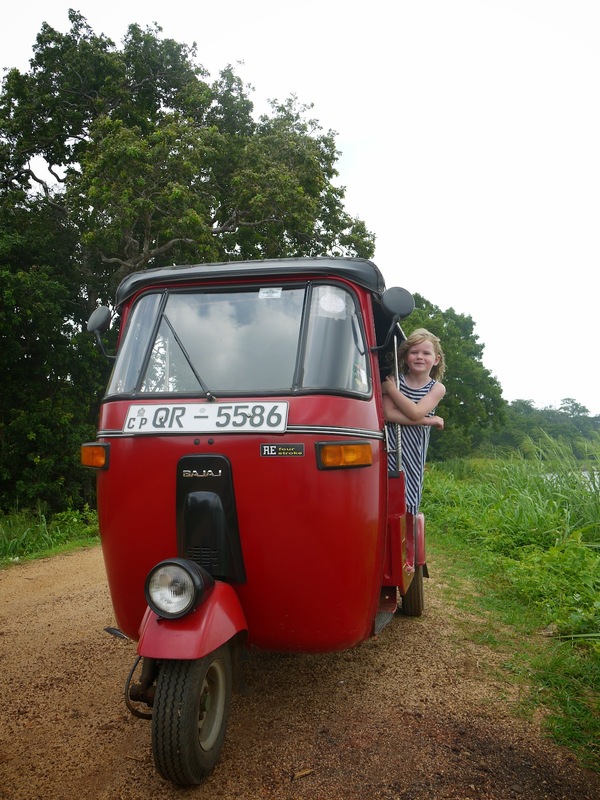 We thought we would see how it went and we could go on to Kandy for 2 nights, or we could stay for 3 nights at the sea and go to Kandy for one night. Well, in the end Tranquility Coral Cottages proved to be so wonderful that we stayed for all 4 nights, entirely missing out Kandy, but seeing both Polonnawura on the way there, and Dambulla caves on the way back. So what with Sigiriya rock and the safari park too, I felt we had seen a lot of the sights of Sri Lanka while also having a lovely relaxed time there and not rushing about too much. But, yes, Tranquility Cottages was wonderful. A very simple one-room hut for me and Danny, and another larger one about 30 yards away for the kids. 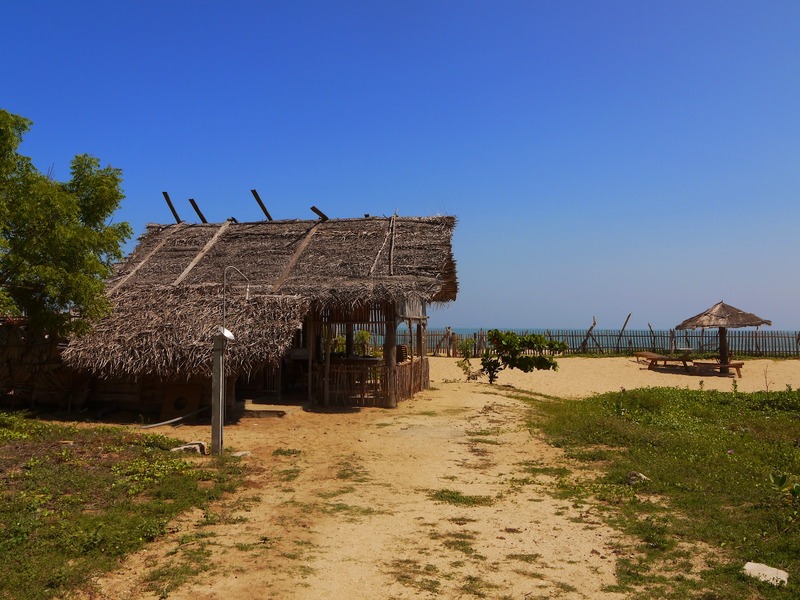 It turned out there only were 2 more huts in total, as well as the reception and eating area and, astonishing to say it, there was no other tourist, or any other kind of development, on the entire sweep of the huge bay of the beach. Danny said he saw a sign at the road junction wanting to buy land on the beach, so this may not be the situation for long. The nearest shop was 4km away. And what an incredible beach - golden sand, swimmable and surfable waves, a big beautiful blue ocean, foaming onto the golden sand fringed with palm trees. The only other people we saw on the beach were the occasional fishermen taking their boats out in the morning, and returning in the evening. They waved cheerily at us and we to them. There was no coral or tropical fish in this Indian Ocean but there were a proliferation of lovely shells - the best ones were picked up in toes while swimming, a relatively easy operation unless you got blindsided by a wave at the time! Joe also woke up the other two mornings to see the sunrise - just about the only time he has ever got himself up in his life. The swimming in the sea was exquisite - the first two days the waves were big and crashing, but the beach is so gently shelving that it was easy to stay safe around them. We had fun swimming them, and jumping them, and occasionally getting totalled by them. The only thing we lacked was a body board for surfing this foam. Luckily the guys working there had a great plan - they cut for us a box made from polystyrene and Joe, Poppy and I used two bootlaces Danny had been carrying in his pocket for just such an emergency as well as, of course, some of the black duct tape that no traveller should ever leave home without, it seems, and created what we called our ghetto surfboard. It was wonderful! 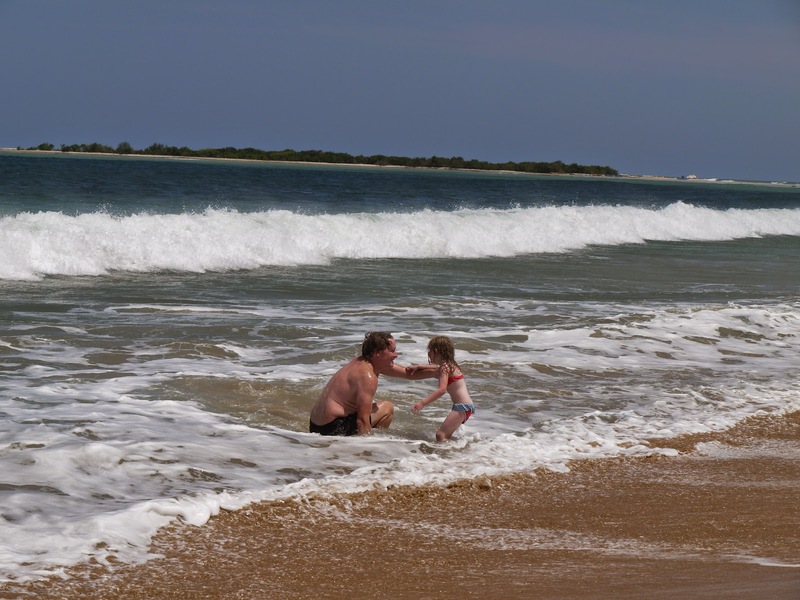 The first two days the surf was big enough that Rosie just splashed in the shallows while we surfed in the sea, catching big waves and zooming into the shallow surf on the sand. On the third and fourth day the sea was very calm so for us it was just beautiful swimming weather, while I said to Joe that I thought it was perfect conditions to teach Rosie to surf for her first time. She loved it! 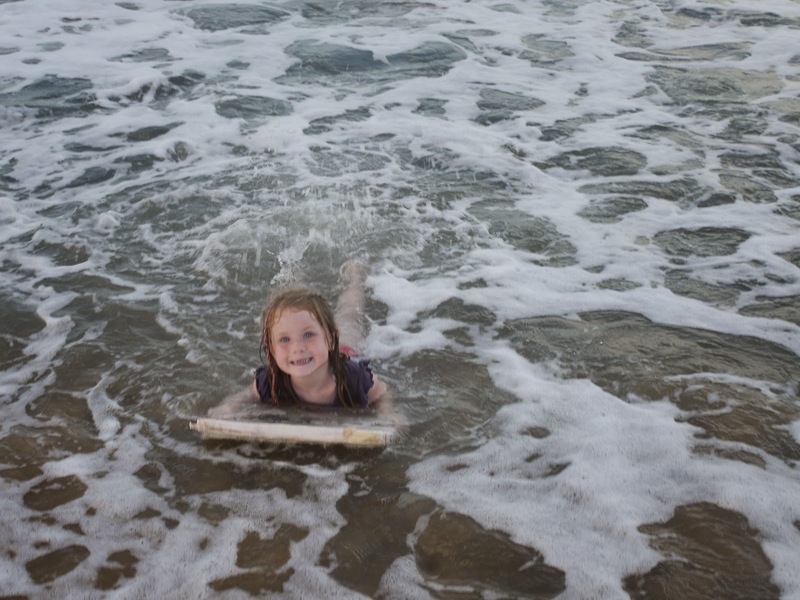 She took to it instantly and within a few waves was no longer needing our help but launching herself into the little waves and into the white surf. Fabulous! And on top of this the food cooked up by the two guys there was absolutely terrific - genuinely the best food we had in Sri Lanka, against some pretty stiff competition. Our days were so simple there - breakfast was at 8.30. 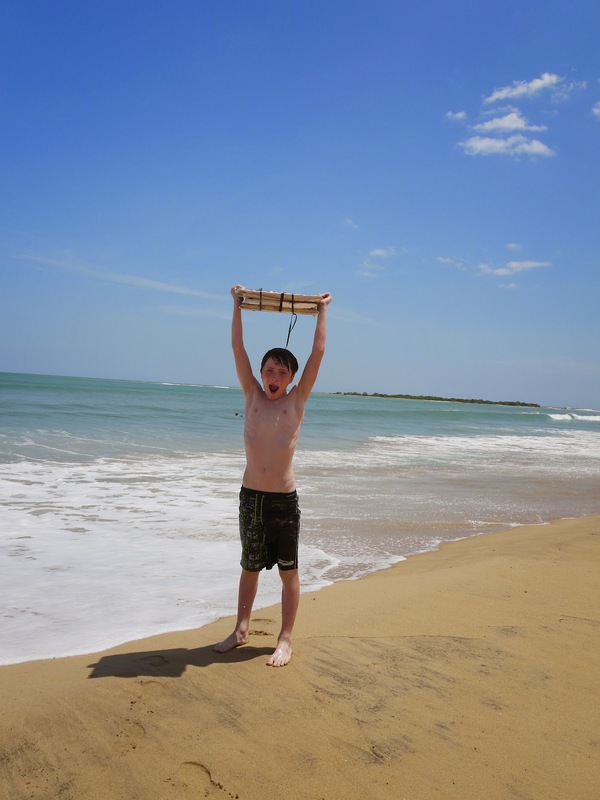 Then it was serious beach school time with Danny and I taking one or two kids each, then frolicking in the waves time. Then lunch at 1pm. Then second beach school session, followed by second frollicking in the waves session. Then the sun set at 6pm, and from then until dinner at 7.30 it was diary writing time plus, as a treat, one episode of Father Ted from our DVD collection!, then dinner and bed. To repeat the next day. Bliss. And all of this for £60 a night for both bungalows and for all our meals. 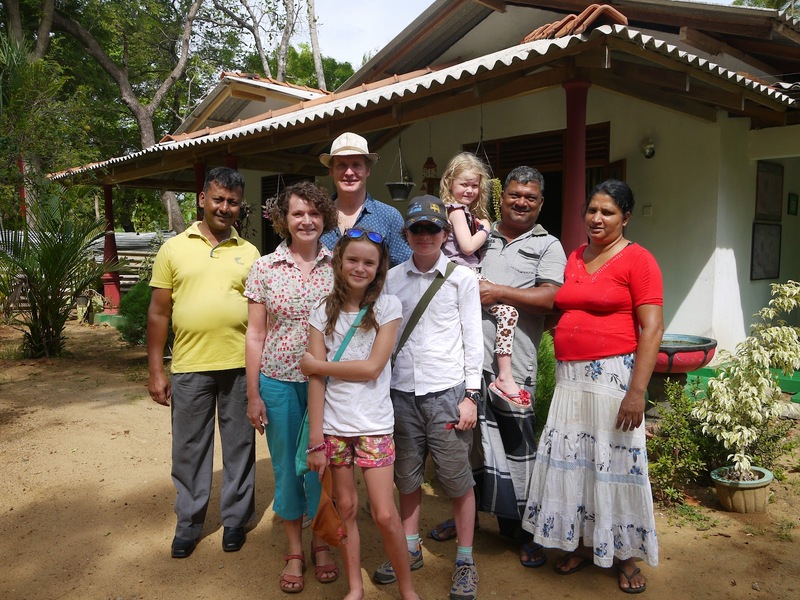 To say we were sad to leave Sri Lanka is certainly an understatement.